BM, cornet; Grachan Moncur III, trombone; Charles Eubanks, piano; Wilbur Morris, bass; Bobby Battles, percussion; Steve McCall, percussion. BM, conduction and composition; John Zorn, alto sax and game calls; Frank Lowe, tenor sax; Tom Cora, cello; Brandon Ross, guitar; Zeena Parkins, harp; Curtis Clark, piano; Eli Fountain, vibraphone; Thurman Barker, marimba, tambourine, snare; Yasnao Tone, voice; Christian Marclay, turntables. Lawrence D. “Butch” Morris is a giant of the jazz world who has cast his longest shadows from the sidelines. He’s best known for his formidable arranging skills on a series of classic albums for David Murray in the 1980s and early ’90s, and especially for his patented development of Conduction — a radical way of re-organizing composition and improvisation. In Morris’s words, it’s “a vocabulary of ideographic signs and gestures activated to modify or construct a real-time musical arrangement or composition.” His conduction technique has birthed such major musical statements as Berlin Skyscraper, Dust to Dust, and the 10-CD set Testament. While those are the touchstones — and frankly, even they aren’t known nearly well enough — Morris has waxed several other albums that deserve canonization. First, there’s In Touch… But Out Of Reach, recorded live in 1978 with a stellar ensemble. It showcases Morris’s more traditional abilities as a cornetist, composer, and bandleader. It’s still adventurous work, but might prove an easier entry for some listeners than the later genre-hopping offerings. In Touch offers key insights into his later work as well as plenty of unalloyed musical pleasure. “Irin Sun” provides a rare chance to hear Morris as a key part of the band, in a decidedly non-epic setting. Primarily a vehicle for Eubanks, who borrows something of Abdullah Ibrahim’s limpid beauty, the track floats by briskly. It’s a lovely, if brief, postcard from Africa. “Lovers Existing” is a more significant statement, and its shifting arrangements and multiple instrumental combinations suggests the grand experiments in conduction to come. In his typical generous fashion, Morris lays out for much of the track, though his guidance is everywhere evident. Wilbur Morris covers a lot of ground in strong support of Moncur’s long solo, and beneath Morris’ late turn about two-thirds of the way in. Current Trends in Racism in Modern America is one of the earliest Conduction albums and a turning point in Morris’s music. It’s slyly subtitled “A Work in Progress” partly because he was still refining his methods and partly because the album title stubbornly remains relevant — it could’ve served as the news banner for much of our recent election coverage. More happily, the music has hardly aged either. Recorded live at The Kitchen on February 1, 1985, it features an all-star cast of downtown musicians, including John Zorn, Christian Marclay, Tom Cora, and Zeena Parkins. It’s interesting to note that the jump cuts, unusual pairings, and unorthodox textures share something with Zorn’s file card compositions of the same period. “Part One” is an epic 35-minute track, complete with an unexpected but successful hip hop breakdown in the middle. “Part Two” only nods glancingly toward hip hop, but it’s a highly charged and suggestive pairing. As befits Morris’ mode of creating, the tune is constantly in the act of becoming — the weft taking an especially winding route through the warp. As the various musical pairings emerge, there is a palpable yet not unpleasant tension, a sense of climbing toward some unreachable height. The song might never end (not that we’d complain). When the end does come, it’s first announced by a thrum of horns and duck calls, chanting in unison, before Barker and the strings wind things down in spellbinding fashion. Point blank, I think Butch’s conduction system is the only way African American improv is going find a way out of its cul-de-sac. 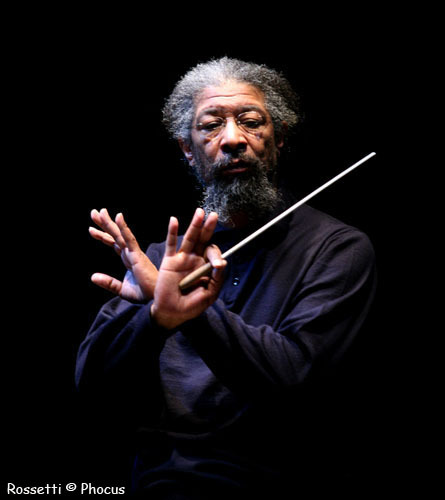 Conduction is a set of baton and hand gestures that Butch has developed. They offer the conductioneer the flexibility of a composer on the bandstand, to make orchestral things happen in the moment. You want to turn that bass riff into a horn section? You want the harp to emulate the drums? You want half the band to play the exact same collective improvisation they were playing 15 minutes ago? You want the cellos to stomp over it like Stravinsky? You want the beat to flip from punk to funk to crunk to a one-drop in the same time it takes to read this? And those are just stunts. The best part is how you can coax a unison sound out of any ensemble no matter the instrumentation or how long the musicians have played together. Butch has done conductions with avid Murray’s big band and bands of Turkish and Japanese musicians playing everything from “folk” instruments to laptops. He’s done them with poets and could probably do them with painters and dancers. The system is that flexible and that precise. Word on the street is that Butch Morris has been hospitalized recently and remains in extremely poor health. This Thanksgiving season, please keep him in your thoughts, prayers, etc. LOST TONES features tracks from hyper-rare recordings that aren’t available anywhere else on the web. These treasures are courtesy of George Scala, who runs the invaluable Free Jazz Research site. He’s generously shared them from his amazing archive so they can be enjoyed by more than just collectors. Each selection is something that we unequivocally love and feel deserves a wider audience. More of these will be coming soon.